It was discovered that there is an Arabian word called Anzac or Anzag–the meaning of which is “To cause to jump!” In view of this distinctive attribute having been so gallantly displayed at the famous landing at Gallipoli and the fact of the word being Oriental, this conception seemed so appropriate that it was forthwith accepted by many. The word bears an unfortunate resemblance to the Turkish ‘ANSAC’ which means ‘almost’. While these curiosities may have ‘almost’ convinced some to ponder their relevance, ANZAC the acronym, and Anzac the name, had origins far more obvious and literal. Simply, ANZAC is the acronym for the “Australian and New Zealand Army Corps”; the result of combining the “Australian Imperial Force” and “New Zealand Expeditionary Force” in the early days of the First World War. At the time, December 1914, both armies were stationed in Egypt under the command of the British officer, Lieutenant-General William Birdwood. ANZAC, in its brevity, was handy for administration uses, it was originally written as A. and N.Z.A.C. Charles Bean3, the Australian historian, noted in 1936 (from a 1915 report) its use as a rubber stamp and as a stencil on packing crates. General Birdwood himself thus relates the origin of the word: ‘When I took over the command of the Australian and New Zealand Army Corps in Egypt, I was asked to select a telegraphic code address for my Army Corps, and then adapted the name Anzac. Later on, when we had effected our landing, I was asked by General Head Quarters to suggest a name for the beach where we had made good our first precarious footing, and then asked that this might be recorded as ‘Anzac Cove’–a name which the bravery of our men had now made historical, while it will remain a geographical landmark for all time. The term Anzac is the abbreviation of the Australian and New Zealand Army Corps and was first adopted by Field-Marshall W. R. Birdwood when he took command of this Corps in Egypt late in 1914. ANZAC is an acronym for the Australian and New Zealand Army Corps which was formed in Egypt from the Australian and New Zealand Division immediately before the landing on Gallipoli in World War One. In Egypt, the Dominion troops were placed under the command of Lieutenant General William Birdwood… he approved the acronym ANZAC for the newly formed Australian and New Zealand Corps. But what about the staff involved in creating the abbreviated “ANZAC” for official purposes, and that soon to be adopted name given to the soldiers; the “Anzacs” who landed at “Anzac Cove”? One day early in 1915 Major C.M. Wagstaff, then a junior member of the “operations” section of Birdwood’s staff, walked into the General Staff office and mentioned to the clerks that a convenient word was wanted as a code name for the Corps… one of the clerks, (according to most accounts Lt. A. T. White) suggested: “How about ANZAC?” Major Wagstaff proposed the word to the General who approved of it, and “ANZAC” thereupon became the code name of the Australian and New Zealand Army Corps. It was however, some time before the code word came into everyday use, and at the Landing at Gallipoli many men in the divisions had not yet heard of it. Regarding the passing of Major A. T. White, by my wartime friend, Mr. H. J. MacLennan, ‘Mac’ is slightly out in attributing to White the coining of the word ‘Anzac’. Present in the room in Shepheard’s at the time of the birth of the word were White, Garside, MacLennan, Frank Shaw, and myself. Major Wagstaff or Colonel Leslie came in and told us to endeavour to hit upon a suitable word for a code address for our headquarters. We set about the job in a listless fashion, and I distinctly remember the concoctions we produced, such as “Ausnew,” and various such combinations of the long-winded title. It was while pondering on the business that I sorted out the letters (A.N.Z.A.C. ), and made the suggestion to White that perhaps the word they formed would serve. At that moment, Leslie came into our room, and White offered the suggestion to him. He said, ‘Anzac!’ H’mm, sounds all right, I’ll see the General.’ He left to consult General Birdwood, and finally the name was adopted. Little and Millington had cut a rubber stamp, with the initials A. & N. Z. A. C. at Corps headquarters, situated in Shepheard’s Hotel, Cairo… when a code name was required for the Corps, a British officer, a Lt. White suggested ‘ANZAC’. Little later claimed that he made the original suggestion to White. It was in general use by January, 1915. The acronym itself was probably devised at Birdwood’s headquarters by a New Zealand clerk, Sergeant K.M. Little, for use on a rubber stamp. Some time later it was taken on as the telegraph code word for the corps. 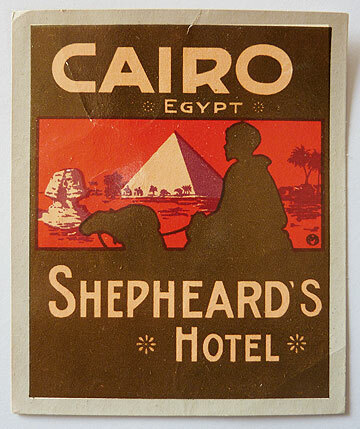 Shepheard’s Hotel, Cairo, Egypt. Luggage Label. This entry was posted in ANZAC and tagged Anzac, Australian Army, Gallipoli, New Zealand Army, Turkey, World War One, WWI. Bookmark the permalink.